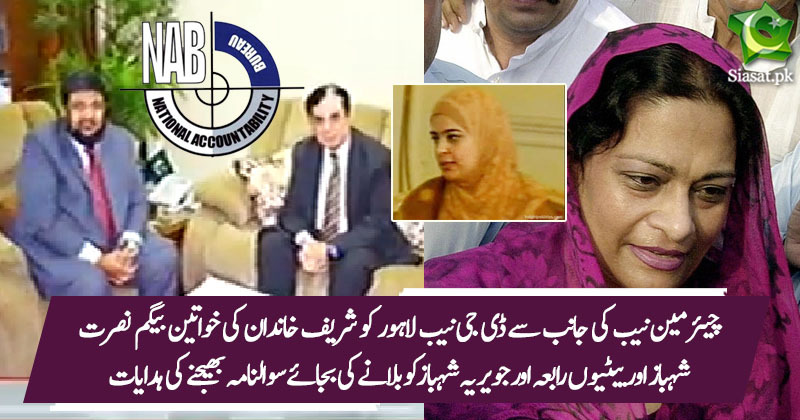 Chairman NAB withdraws notices issued to summon Shehbaz Sharif's wife, daughters. chaddar n chardiwari apply only on sharif n zardari families? still 2 pakistan. IK sahib we waiting for when it will be one pakistan. Was she under NAB investigation?????? What about common man ? i don't know correct if i m wrong is shahbaz daughters are public office holder ? That’s a good question btw y not ? This rotten elite is taking us to complete destruction. Is this facility available to common thieves? There are thousands of poor woman rotting in Jails. This so called Chadar Chaar deewari applies to Aal e Shar only! Look at the working of NAB,One DG issues notices ,next Day Chairman withdraw notices ,TUf he tum per ,Chadar Char Diwari Kaya, Dekho jurm hoa he ya nahi.yeh Mashra Khatarnak surat e hal k tarf ja raha he. It were also a woman who was alleged of stealing something and when reached for the decision in the court of the Prophet of Islam, peace be upon him, the influentials approached and requested for forgiveness to her for her being an influential lady but everyone claiming impunity in the name of chadar and chardiwari must understand that the Prophet, peace be upon him said he would not have spared even if it were his own daughter Fatima as the nations were destroyed who let the influnetials go scot free and only the poor were punished. So no one is above the law on the basis of their gender and no one sought an excuse in that court in the name of gender either.